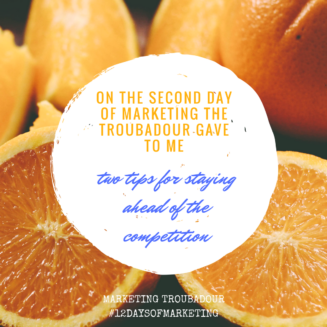 On the second day of marketing, the troubadour gave to me TWO tips for staying ahead of the competition: be consistent and nail your follow through. Although these things sound like basic skills everyone has, everyone does not do a good job with them. Building customer trust is the key to customer loyalty, and you can’t build it with inconsistency and poor follow through. Consistency is more than just following a schedule, although that is extremely important. Brand consistency includes telling the same story every time, having the same look across everything you do, and creating the same customer experience time after time. Consistency shows a commitment to your business and your customers. Follow through could possibly be the most neglected business skill of all. Yes, everyone is busy, but trust is built on meeting client expectations. Have you heard the saying “Under-promise and over-deliver”? Customers love knowing exactly what to expect from you, and being informed. Keep your customers informed, and they will think more highly of you than your competitors who don’t. We all know that things can still go wrong occasionally, but customers who trust you are more understanding when mistakes do happen. Don’t focus on what your competitors are doing, leverage what they are not doing and do those things better for your business and your customers.